Israeli soldiers abducted, earlier Monday, at least ten Palestinians, including two children, and summoned one for interrogation, after invading and searching many homes in the occupied West Bank. 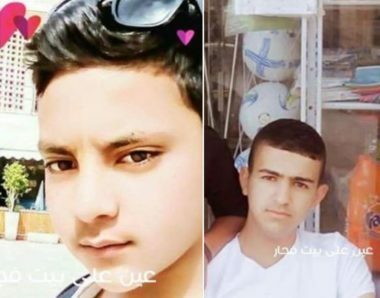 The Palestinian Prisoners’ Society (PPS) has reported that the soldiers searched homes in Beit Fajjar town, south of Bethlehem, and abducted two children, identified as Yazan Mahmoud Taqatqa, 15, and Mofeed Mohammad Taqatqa, 14. The PPS added that the soldiers also abducted Bara’ Riyad, Mojahed Harm ad-Dali and Qassem Jamal Hmeidan, from their homes on Biddu and Qotna towns, northeast of occupied Jerusalem. The soldiers also searched homes in Ramallah, in central West Bank, and abducted Omar Ladadweh, Yousef Oleyyan and Zohdi al-Khawaja. In occupied Jerusalem, the soldiers abducted a student of the Al-Aqsa School, in the Al-Aqsa Mosque compound, and took him to an unknown destination. In Tulkarem, in northern West Bank, the soldiers invaded homes and searched them, before abducting a former political prisoner, identified as Salaheddin Awni Abdul-Ghani. In Hebron, in southern West Bank, the soldiers broke into and searched many homes in several neighborhoods, and summoned Midhat al-Juneidi for interrogation in Etzion military base and security center, north of Hebron. The soldiers also invaded Ethna, Yatta and as-Sammoa’ towns, near Hebron, and installed roadblocks at Hebron’s northern entrance in Jouret Bahlas area, in addition to Sa’ir and Halhoul towns, before stopping and searching dozens of cars, and interrogated many Palestinians while inspecting their ID cards.